BUTLINCAT's BLOG: SHOCKING: MAY APPLETON'S SONS EVICTED: HANG YOUR HEADS IN SHAME, WEAVER VALE HOUSING TRUST! SHOCKING: MAY APPLETON'S SONS EVICTED: HANG YOUR HEADS IN SHAME, WEAVER VALE HOUSING TRUST! May Appleton died during the harrassments from these characters - now her sons have been evicted from their home May moved into 67 years ago. It is with a very heavy heart that I have to inform you that the judge completely dismissed anything we put forward at the so-called 'pre-trial' hearing on Thursday. I am devastated. I have no legal training and so far the sons have only thrown money at solicitors who have not helped them. They desperately needed a solicitor who could help them bring forward a case against WVHT for illegally and immorally interrupting their mother's RIGHT TO BUY. If that had been allowed to go through, this problem would have gone away. No solicitor seems interested in this now that May has died. YET it is still affecting her sons! When we entered the court on Thursday, we had no legal representation. I tried to explain why to the judge. However, she considered that the sons had not tried hard enough to remain in what she termed as 'someone else's property'. This, despite the family paying full rent for over sixty years and May being one week away from completing the purchase of the home when WVHT evicted her. One of the few ways of preventing a legal RIGHT TO BUY is to evict the occupants! A disgraceful way for a charitable trust to behave. I put all this to the judge but she only concentrated on financial details. She said a full trial which was booked in for July over two days, would cost too much. Despite the fact ALL evidence would be aired over those two days. So she decided that WVHT could evict the sons at the pre-trial hearing....then......at a cost of nearly £9k....and the sons had to pay that. Now, if the story of a family who help out at the church, keep themselves to themselves despite problems caused by neighbours, have paid full rent on a house for sixty years......so have paid for it over and over...If the story of an 87 yr old woman winning enough on the lottery to buy that house for her grown up sons. 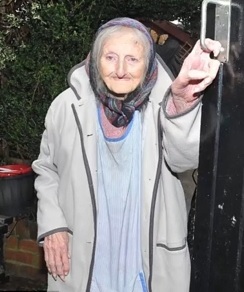 If the story of a woman of 87yrs of age physically removed from a property she thought she had bought.....and died in temporary accommodation in considerable stress...if that story is acceptable when it is not Dickensian times and the landlord is a 'charitable organisation'...well, what can I say? Do YOU find it acceptable? WVHT have waited until the media coverage has died down before proceeding to evict the sons again. They have refused to even consider allowing them to use May's money to buy the house and solve this problem. They are using excuses that the house full of contents is 'dangerous' to neighbours when there is absolutely no evidence to prove this as any fire would quickly be detected by neighbours before their property was affected. WVHT have depended on gossip from a neighbour who has told them that the sons have took more stuff into the house. I have been in the house. Stuff has actually been removed and ALL exits - windows and doors are clear and accessible! They told the judge that they had not been allowed to enter the property when the sons had begged them to do repairs....WVHT said no repairs despite the sons paying full rent. May was entitled to a massive discount on the house. I put it to you that THAT is the real reason WVHT decided to prevent the right to buy. As the tenancy could not be passed on to the next generation, no matter how vulnerable they are..... they knew they just had to stop May buying, as they could take back the house on her death. I have been DISGUSTED by what I have found out concerning a so-called charitable housing trust. I am out of ideas but intend to keep fighting rather than see three vulnerable men out on the street. PLEASE, if anyone has any ideas. PLEASE get back to me with them. Thank you for signing the petition WEAVER VALE HOUSING TRUST - Let May Appleton's sons BUY!, can you help spread the word by forwarding the link below to your friends? Susie English started this campaign on the 38 Degrees Campaigns by You website. If there's an issue close to your heart that you'd like to campaign on, you can start your campaign here.